Norland Optical Adhesive 65 ("NOA65") is a clear, colorless, liquid photopolymer that will cure when exposed to ultraviolet light. Since it is a one part system and 100% solids,it offers many advantages in bonding of optical materials where the bonding surface can be exposed to light. The use of NOA 65 eliminates premixing, drying and heat curing operations common to other optical adhesive systems. Curing time is remarkably fast, and is dependent upon the thickness applied and the amount of ultraviolet light energy available. The cured adhesive is very flexible and was designed to minimize strain. NOA 65 is especially suitable where the adhesive cross section would be relatively thick. NOA 65 has enough elasticity to keep strain to a minimum even when dissimilar materials with different coefficients of expansion are bonded together. Typical applications would be potting of lenses in metal mounts, bonding plastic to glass and cold blocking. NOA 65 is cured by ultraviolet light with a maximum absorption within the range of 350-380 nanometers. The recommended energy required for full cure is 4.5 Joules/sq. 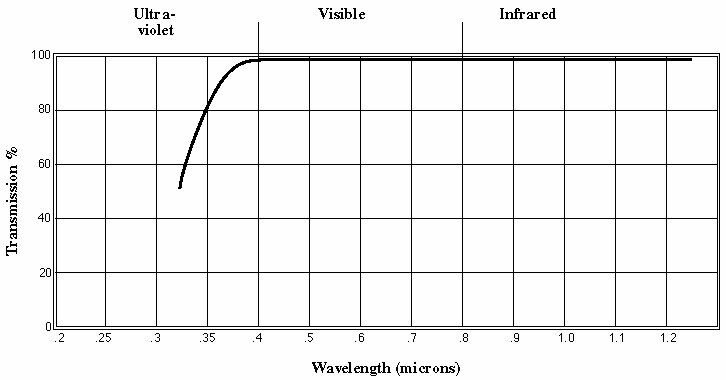 cm of long wavelength UV light. The polymer has minimum oxygen inhibition, and therefore any surfaces in contact with air will be non-tacky when fully cured. Some of the light sources that can be used to cure the adhesive are sunlight, mercury lamps, and fluorescent blacklights. For cleanup of the adhesive, acetone can be used if the cure has not progressed to far. If fully cured, methylene chloride can be used to soak assemblies apart. Shelf life of the liquid is a minimum of 6 months from the date of shipment, refer to the package label for the actual expiration date, if stored in a cool (5-22° C), dark place in the original container. If refrigerated, allow the adhesive to come to room temperature prior to use.